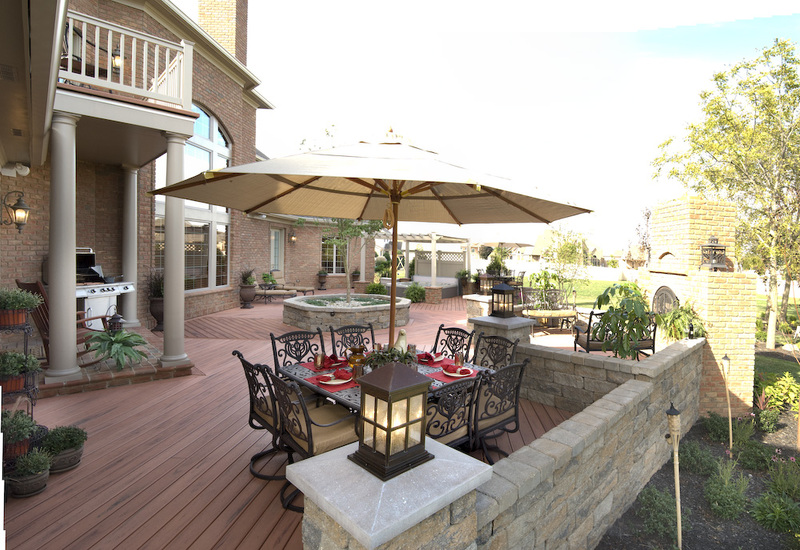 Archadeck of Columbus delivers the forecast in what is hot in outdoor living trends for this Spring. Deck and patio combinations, as well as porch and patio combinations seem to be at the top of the list. This photo shows how each of the structures,the custom deck, screened porch and patio by Archadeck of Columbus work together as one. We are really excited about the outdoor living season this year. We recently took part in two fantastic home shows in the area and got tons of ideas on the outdoor living trends for this Spring. While at the show we had a great deal of interest in not only decks, but also adding a patio to your deck. The trend we see is that Columbus area homeowners are requesting the addition of a patio to go with their new AND existing decks and porches. It stands to reason that even when it comes to outdoor living structures the hot new idea is to double the fun. The great part about adding a hardscape, such as a patio, to your deck or porch is that it is the perfect add-on to give you those multiple outdoor living areas that you really want. 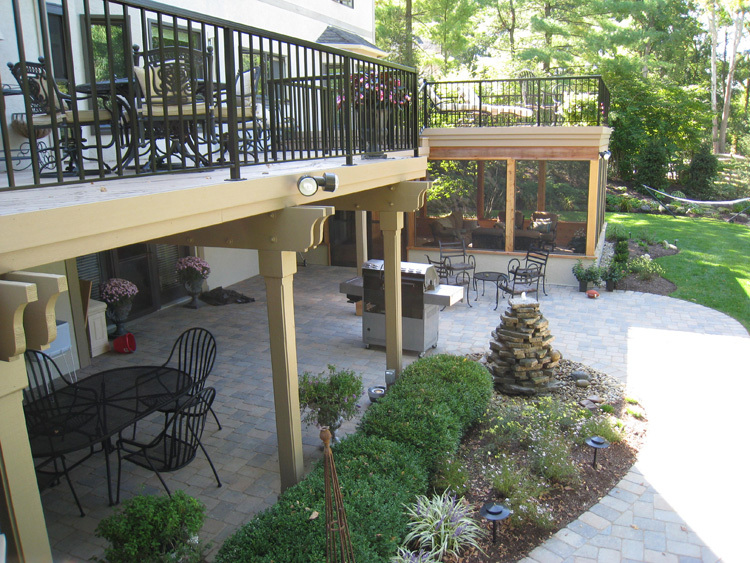 A patio can be added with a new, or existing, deck or porch at anytime. Adding a patio to your deck is a great way to spice it up and put that spark back into your outdoor entertaining as well enhance the beauty in your backyard. Wouldn’t it be great to have your deck serve as your outdoor cooking or gathering location and have a beautiful patio adjacent to use for dining and conversation? Or even a deck that leads into a covered hardscape patio with a fully functional outdoor kitchen? The entertaining opportunities that open up to you when you think about a dual structure such as a deck and patio combination are endless. Having multiple living areas within your outdoor design can offer more room and expand the functionality of your design. We can design a project for you that will turn your backyard until the ultimate backyard oasis. Archadeck of Columbus also offers “phased building”. This means we can plan upgrades or additions to your current project to accommodate for later additions or enhancements. 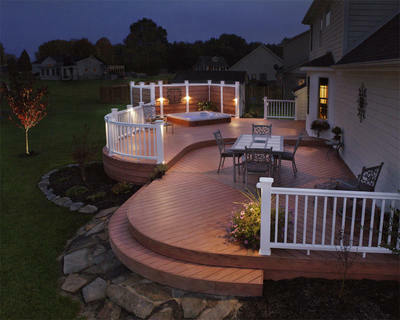 For instance, if you really want a deck for this season, but foresee the future facilitating a patio and deck combination, we can make all the necessary adjustments in advance so when your budget allows you to add the patio a little later the structural necessities needed to make the transition run smoothly are already put into place. New TimberTech colors – you heard it here first! Archadeck of Columbus is ringing in 2012 with the addition of a trio of TimberTech heavyweights. Radiance Rail Express and two new color collections for the Earthwoods Evolution line of composite decking. Welcome the Tropical collection and the Natural collection, both packed with quality, longevity, durability and beauty. The world of composite/synthetic decking just got a little more interesting. Not so long ago you may remember the minimal choices in colors and textures that were available to homeowners who chose to use composite/synthetic decking. This is no longer the case. 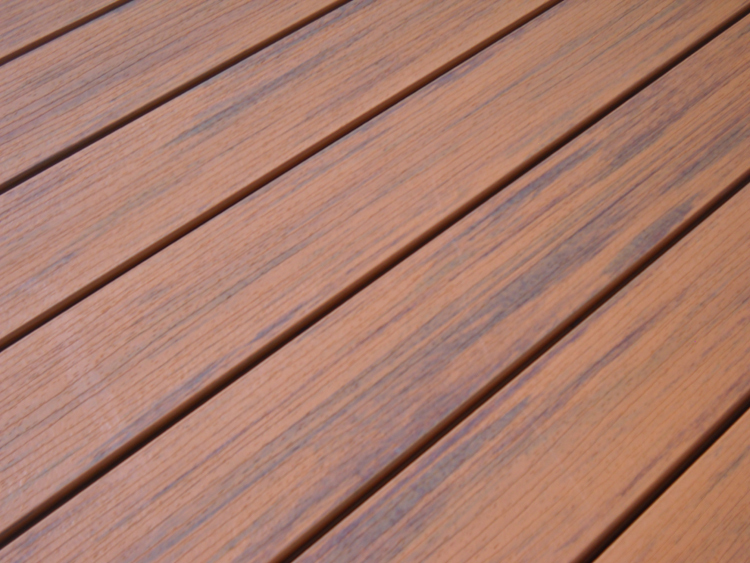 Composite decking now comes in a wide array of colors and finishes. The realistic look of synthetics make even a seasoned expert have to walk a little closer and lean in a little further to tell the difference between composites and wood. TimberTech synthetic decking is a frontrunner in the composite industry and has introduced some stunning new additions to its palette in the Earthwood Evolutions line for this year. TimberTech introduced the “Tropical collection” which includes Pacific Teak, Pacific Walnut and Pacific Rosewood in 2011. What makes this collection a real showstopper is the realistic graining, streaking and undulation that mimics real wood so beautifully. This collection takes all the positive attributes of exotic hardwood decking and makes it a decking material that will truly endure the tests of time and mother nature. New in 2012 is the debut of TimberTech’s “Natural collection”. This collection is made with same top quality ingredients that go into the TimberTech winning recipe but offers a more even toned, non-streaked composite. The new color introductions include Brick, Brownstone and Slate. The absence of streaking makes the Natural collection a little easier on the wallet than the choices in the Tropical collection, but with the same quality, value and beauty that TimberTech is known for. Both the Natural and Tropical collections are part of the Earthwood Evolutions line from TimberTech. The resiliency and durability of this line of decking is among the best in the business. The construction includes a wrapped PVC composite board made with a proprietary composite core. This evolutionary approach boasts a product with superior scratch, stain and fade resistance backed by a 25-year fade and stain warranty. Just a little soap and water cleanup will keep your deck looking like new year after year. 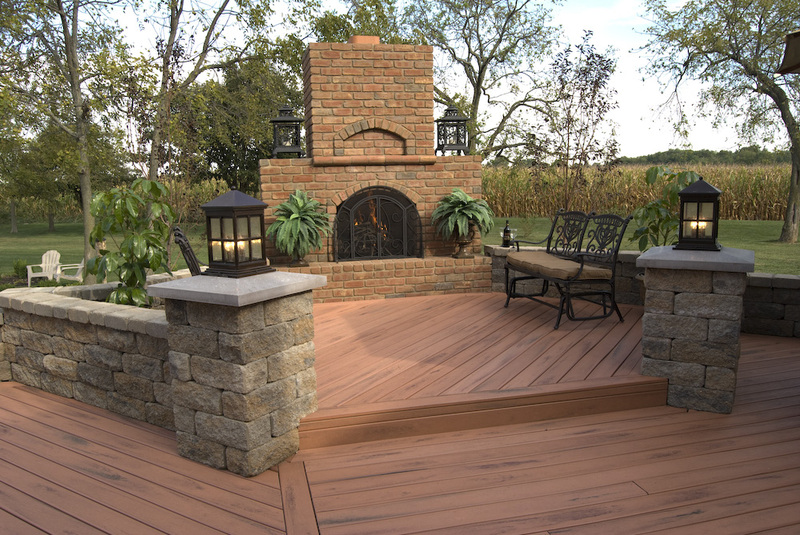 Archadeck of Columbus is proud to offer our customers the new arrivals to this exquisite TimberTech line of products. 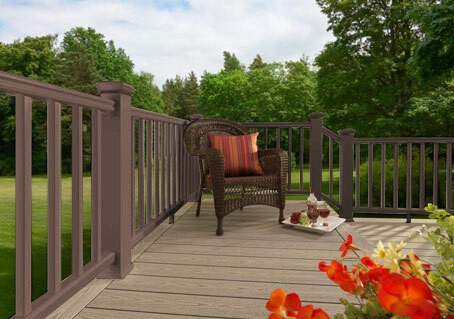 To add to our arsenal of aesthetically pleasing and durable composite products we also offer the newest addition to the Radiance Rail collection to compliment your TimberTech deck perfectly. Radiance Rail Express was introduced in mid-2011 in white. New colors to the line include Walnut and black. Radiance Rail Express is less expensive than the original Radiance Rail, PVC, vinyl or composite rails that have a PVC cap. Even though synthetic rails are still more expensive than wooden railings, the benefits outweigh the costs in the long run. The Radiance Rail Express has a routed baluster receiver for clean and easy installation and also comes backed by a limited 25-year warranty on residential applications. With a wide array of shapes and colors to choose from, Radiance Rail offers you a high quality clean finished railing system that coordinates perfectly with all TimberTech decking colors. This rail offers you an upscale, finished look that is durable and will outlast and outshine wood each and every year. Author archadeckofcolumbusPosted on February 23, 2012 Categories Archadeck of Columbus, Composite Deck Builders Columbus OH, Composite decks, Contractor quality, Cost versus Value, Deck Builders Columbus Oh, Deck Builders Columbus Ohio, Deck Construction Columbus Oh, Deck Construction Columbus Ohio, Decks, Decks Columbus Oh, Decks Columbus Ohio, Low Maintenance, PVC Decking, Re-decking, Timbertech, TimberTech Evolutions deckingTags Archadeck of Columbus, Columbus composite decking, Columbus deck builder, Columbus decks, Columbus TimberTech decks, composite decking, Composite decks, Compsite wood decking in Columbus OH, Decks, decks Columbus, outdoor living, Radiance Rail, Radiance Rail Express, TimberTech deck builder Columbus OH, TimberTech deck Columbus, timbertech decking, timbertech decks, TimberTech Earthwood Evolutions, TimberTech Evolutions, TimberTech Natural collection, TimberTech Tropical collectionLeave a comment on New TimberTech colors – you heard it here first! Do you want to enjoy your new deck in Spring or wait until Summer? Archadeck of Columbus urges homeowners to schedule their outdoor structure endeavor now to ensure a spring ready completion. Imagine this beauty ready and waiting for you to enjoy with the first blooms of spring. Usually our phones start to ring off the hook around Groundhog day each year. Whether it’s only six more weeks to spring, or six more weeks of cold weather, that’s when many people start thinking about getting started on their new deck or porch or patio. No matter how you look at it the answer comes out to the same conclusion. Spring is just around the corner. With that sudden realization, whether it comes from a groundhog, or the first traces of dandelions sprouting under the snow, many homeowners are getting ready to get started on their spring projects. A new deck or outdoor structure can be ready for you to enjoy this spring. On average a typical deck project takes about a week to construct. But what takes time if you’re working with a reputable builder is getting your project scheduled. Reputable builders will have projects on the docket and may be 6 or 8 weeks out before they can start your project. Unfortunately, many homeowners wait until they are within the warmer months to begin planning their outdoor project, and this often means a longer wait time to start enjoying the benefits and living outdoors. Right now in early February when people sign, we are scheduling start dates in March for the structures to be ready in April. We serve our customers on a first come, first serves basis and if you wait too long, you won’t be able to enjoy your project this year in the prime months of the year. Here in Columbus we build year-round and cold weather does not keep us from constructing your deck , screen porch or other structure. It’s so important to call early to avoid long wait times and to ensure you get to enjoy your structure this spring. Being the early bird is vital in getting the outdoor structure you have dreamed about all winter ready in time for for those warm, sunny days. Contact Archadeck of Columbus to get started. Give us a call for a free consultation and come see us at the Central Ohio Home & Garden Show Sat Feb. 25 – Sun Mar. 4 located in the Celeste building booth #2306 & 2308. See you there! Author archadeckofcolumbusPosted on February 22, 2012 February 23, 2012 Categories 3 and 4 season rooms, Archadeck of Columbus, Composite Deck Builders Columbus OH, Contractor quality, Deck Builders Columbus Oh, Deck Builders Columbus Ohio, Deck Construction Columbus Oh, Deck Construction Columbus Ohio, Decks, Decks Columbus Oh, Decks Columbus Ohio, Multi-level decks Columbus, Mutil-level outdoor living structures Columbus, Outdoor Kitchens, Patios & hardscapes, Paver Patio Design and Installation, Paver Patios, Paver Patios Design and Installation Columbus, Pergolas, Retaining Walls Columbus Ohio, room addition, screen porch, Screen Porches, Screen Porches Columbus, Screen Porches Columbus Oh, Screen Room Columbus Ohio, Screen Rooms Columbus Oh, Screened Rooms, Screened Rooms Columbus, Screened Rooms Columbus Oh, SunroomsTags Archadeck of Columbus, Central Ohio Home and Garden Show, Columbus deck builder, Columbus decks, Columbus porch builder, decks Columbus, gazebos, outdoor living, Patios & hardscapes, Paver patios Columbus, Pergolas, Rustic Screen Porches, Screen Porches Columbus Ohio, Screened Rooms Columbus OhioLeave a comment on Do you want to enjoy your new deck in Spring or wait until Summer? Do you know why Winter is actually the best time of year to build a new deck? Archadeck of Columbus explains when is the most opportune time to build your new deck and why. Many of our Columbus homeowners ask me when is the best time to build a new deck? Many of you may think that the best time to build a deck is the spring, but the truth is, the best time to consider building a new deck may be in the winter. The best way to explain the reasoning behind a winter deck construction is what i would refer to as the “give and take” of the project. Give and take refers to the use of pressure treated wood during the winter months. The give refers to the woods expansion, and the take refers to the woods contraction that is caused by the effects of varying outdoor temperatures on the wood itself. The first thing you have to remember when considering building any type of deck or other outdoor structure, whether the decking boards you choose are composite, PVC, vinyl, IPE or hardwoods the foundation of your structure will be constructed using pressure treated pine or another pressure treated wood. Wood curing is important to understand in relation to the wood’s natural tendency to “give and take”, and curing which occurs over the winter months offers many important benefits. Pressure treated wood has a 50% moisture content when you initially build. This fresh lumber is sometimes referred to among builders as “green”. The winter has less humidity and thus the pressure treated wood will stabilize itself and dry more consistently and evenly when you build in the winter. On the other end of the spectrum a summer deck construction exposes the pressure treated wood to higher humidity conditions. In addition, when drying in the hot sun, pressure treated wood will undergo expansion and contraction which can cause cracking, warping and other damage to the wood itself. Due to the orientation of the sun during the winter months, the sun doesn’t beat down on your deck, and the pressure treated wood that holds the key to your project’s structural integrity will not undergo these negative effects. Another benefit of building in winter is you will also experience less wait time and backlogs which are typical in spring and summer projects. Our typical waiting list is 8 weeks in the height of the season, during the winter you are likely going to cut that wait time in half. A winter project also causes less lifestyle interruption because homeowners typically spend less time outdoors and less time participating in outdoor activities during the colder months of the year. You will also experience less deterioration of the ground, and less turf damage during the winter months because of the dormancy period that Columbus landscapes experience through the cooler months. Author archadeckofcolumbusPosted on November 16, 2011 December 14, 2011 Categories Composite Deck Builders Columbus OH, Composite decks, Deck Builders Columbus Oh, Deck Builders Columbus Ohio, Deck Construction Columbus Oh, Decks, Decks Columbus Oh, Low Maintenance, Low-to-grade decks, Maintenence of Wood Decks, Multi-level decks Columbus, Pressure Treated Pine, PVC Decking, Quality construction standards, Re-deckingTags Archadeck of Columbus, Benefits of a winter outdoor structure construction, Columbus decks, Columbus OH staged building options, composite decking, Composite decks, Curing periods for Pressure treated wood, Decks, decks Columbus, Patio and deck combinations, Patio and deck combinations Columbus, Patios & hardscapes, PVC Decking, Rustic Screen Porches, Screen Porches, Screen Porches Columbus Ohio, Screened Rooms, Screened Rooms Columbus OhioLeave a comment on Do you know why Winter is actually the best time of year to build a new deck? 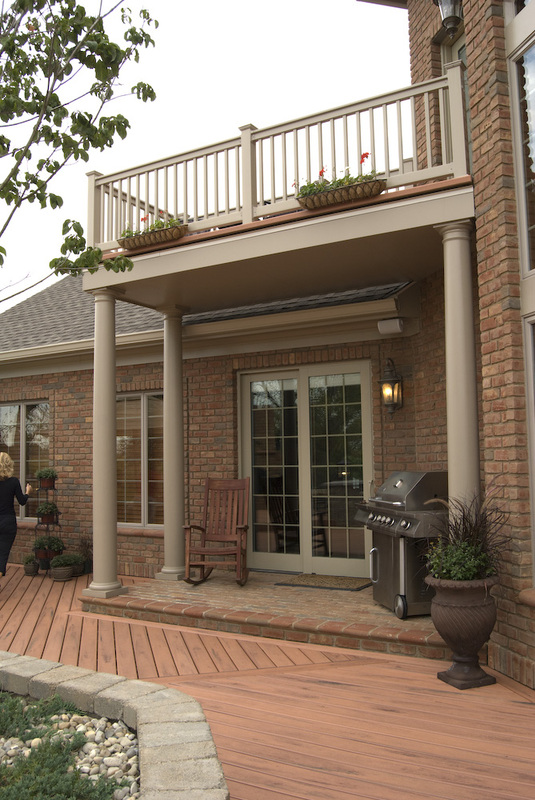 This composite deck in Washington Courthouse, OH is so much more than a deck. It is an outdoor oasis that is so functional and breathtaking in it’s design it has gained media attention and won numerous awards. Archadeck of Columbus was able to weave a cohesive design using the highest quality materials and expert craftsmanship that indulges the senses with a deck that incorporates a hot tub deck flanked by a pergola and privacy wall, an outdoor fireplace, grilling area, custom planters and retaining walls, and every expert detail you could imagine. 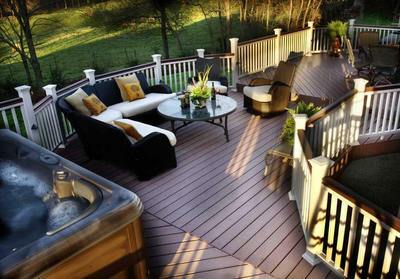 This composite deck by Archadeck of Columbus is a virtual fantasy of relaxation and elegance. If you were to imagine the backyard of your dreams, what would it look like and what functions would it address for you and your family? Imagine being able to soak in the hot tub on your custom hot tub deck on a cool autumn evening while listening to the crackling of a fire burning in your own outdoor fireplace. This outdoor structure takes advantage of mingling two of nature’s most mesmerizing elements – fire and water. Archadeck of Columbus has created a masterpiece of design with this multi-level deck complete with an outdoor fireplace for the ultimate in backyard enjoyment. This outdoor living area flows effortlessly in a carefully planned series of functional vignettes that make the structure a joy to use for these Washington Courthouse, OH homeowners, and indeed a feast for the eyes as well. When we began to plan and design the structure we were given a blank canvas to work our magic on because the home was brand new. The landscaper had completed the landscape design and brought us into enhance the home and landscape for the homeowners with an outdoor structure design that would bring out the best of every attribute of the stunning home and the landscape. The homeowners were looking for a design that would be great for entertaining on a grand scale with plenty of room for a crowd as well as the capability to play on the structures ability to create intimacy in a way that would be comfortable for a smaller crowd. Another crucial design element the homeowners wanted is a planting area incorporated into the deck. Here is an awe-inspiring view of the entire structure from the backyard of the Washington Courthouse, OH home. Archadeck of Columbus went to work on the design and came up with a deck with a surround of stunning stone retaining walls, custom stone planters, a hot tub deck with a custom pergola and privacy wall, grilling area, and plenty of room in between for dining and conversation. At one end of the deck there is an outdoor fireplace flanked as well by custom stone retaining walls and plenty of room for seating upon an elevated section which surrounds the outdoor fireplace. In order to achieve complete harmony in relation to the home the color selections played a huge role and tied everything together. We matched the brick used on the outdoor fireplace to the brick on the home. We also chose a color for the large composite deck that would blend beautifully with the stonework and columns and pillars that were used to create this magnificent outdoor structure. We even matched the lanterns that are used throughout the structure atop the caps on the retaining walls to continue the neutral, rustic feel that is present throughout the design of the entire structure. 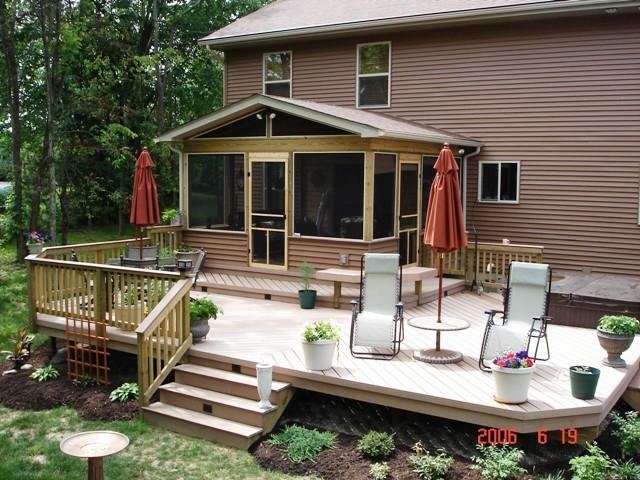 This image shows the beautiful colors and the realistic wood grain of the composite decking used on this fabulous deck. We chose to use composite decking material on the deck. Composites are ultra low maintenance and don’t require staining or sealing. Composites are also scratch and stain resistant, and many are impervious to insects, mold and mildew as well. They are also long-lasting and cannot be damaged by the moisture which is present when you use the hot tub. With this particular deck, using composites gave us the freedom to install the decking boards on a beautifully interesting angle which only adds to the appeal of the deck. Notice how the design and placement of the hot tub deck, pergola and privacy wall offers shade and intimacy for the homeowners when the hot tub is in use. The pergola which is placed above the hot tub to add character and offer some shade in deflecting the suns rays is made from vinyl by Mt. Hope Fence, Ltd. The privacy wall which matches the pergola, is also constructed of vinyl as well. Vinyl is a durable material which offers many of the same attributes of composite decking in that it is durable, maintenance free and won’t succumb to rot, insect damage and decay like wood can. The choice to use vinyl alongside the composites means this deck and the details used within the deck will give these Washington Courthouse, OH homeowners many years of carefree enjoyment without the worry of painting or staining in the future. Careful attention was paid to every detail from the columns to the paver border used on this entrance into the home from the deck. 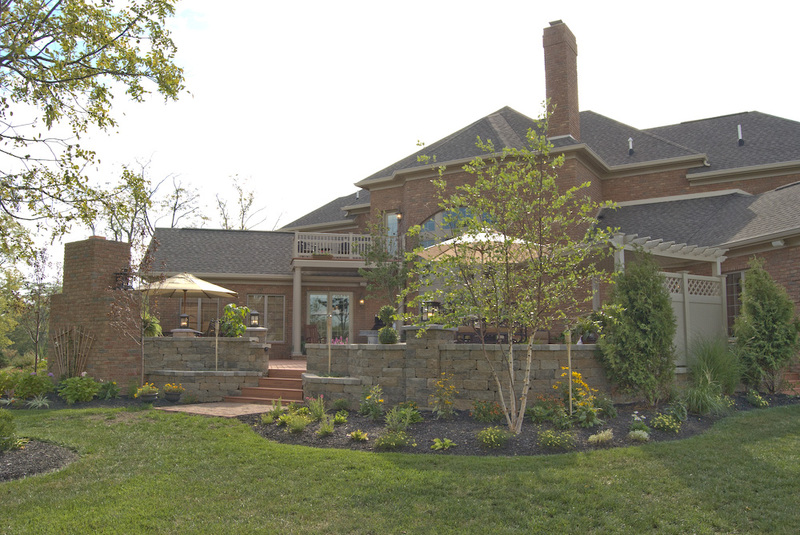 The stone surround and retaining walls were constructed using Celtic retaining walls by Belgard. The retaining walls gives strong concrete elements and uses the aspects of old stone to create an elegant old world appeal. By using this high quality innovative retaining wall system by Belgard, Archadeck of Columbus was able to facilitate the creation of curves within the retaining walls surrounding the deck that would not have been possible by using natural stone or other materials. Archadeck of Columbus paid close attention to every detail within the composite deck and accompanying structures. From the color choices made to paint the columns and pillars that help frame the beauty of the deck’s entrances into the home, to the use of custom paver borders used to outline and enhance the grill area. No stone was left unturned in terms of the use of cohesive design within this structure. The pairing of stone, composites, vinyl, and detailing truly creates a match made in heaven for this home in Washington Courthouse, OH. The perfect place for a backyard barbecue. We were able to create a masterpiece of beauty, design, functionality and enjoyment with this outdoor structure. 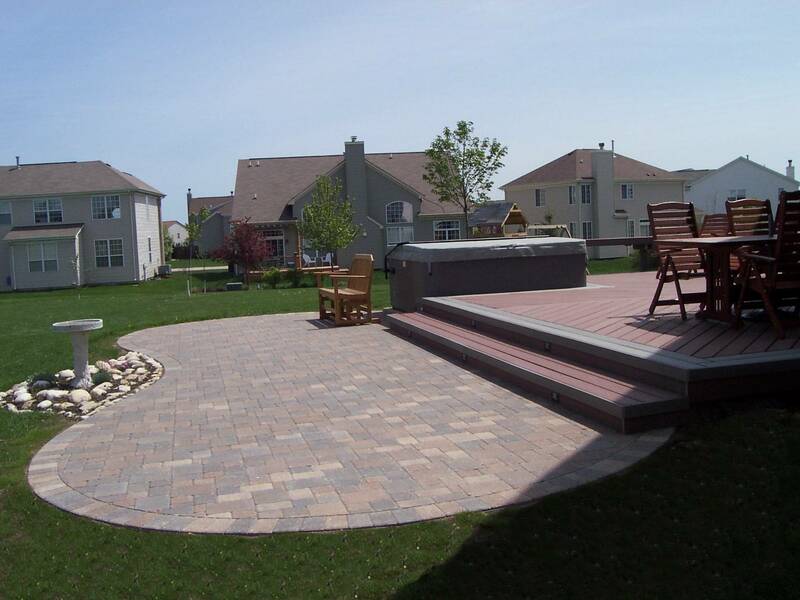 The homeowners continue to enjoy their new deck and all it’s amenities more and more each day. This is truly the outdoor oasis of their dreams, and they get to live the reality each day, and for many years to come as well. 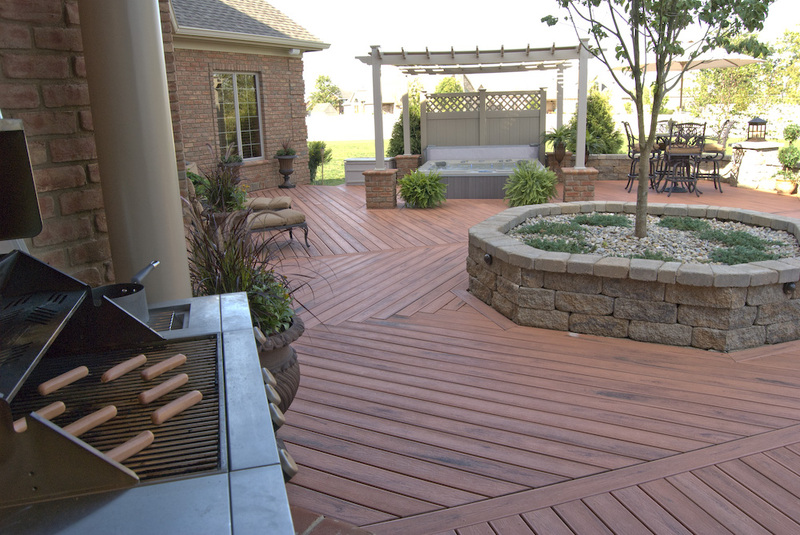 If you have a dream of creating an outdoor oasis within your backyard, contact Archadeck of Columbus to turn that dream into a reality. Call us at (740) 879 – 3730 or email us at westcolumbus@archadeck.net to learn more. 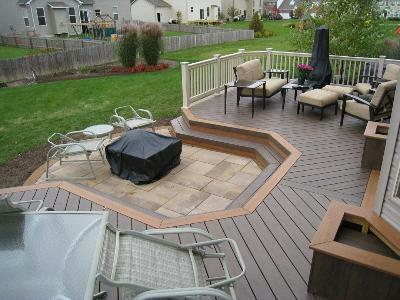 Visit our Composite and vinyl decks photo gallery located on our website for more picture perfect composite decks. To turn up the heat on design inspirations you can also visit our outdoor fireplace and fire pit gallery, also located on our website. 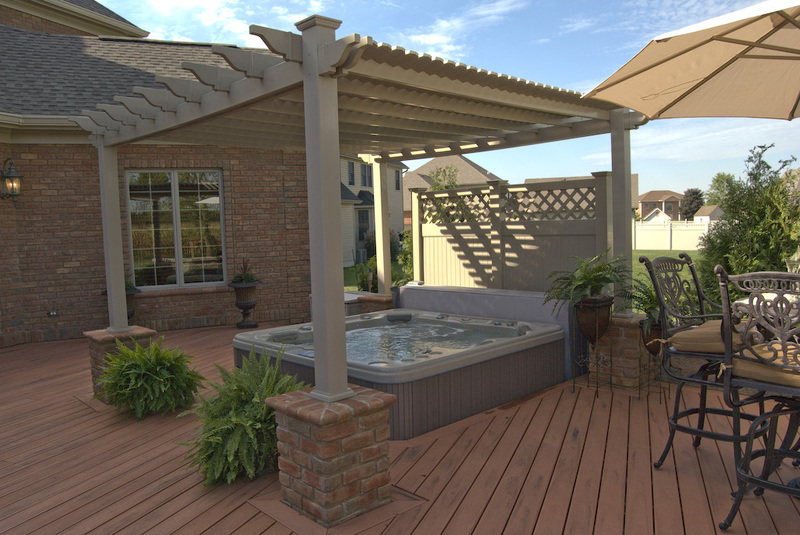 A custom hot tub or spa deck is a personal place of refuge and relaxation for many homeowners. Archadeck of Columbus takes the plunge into tranquil spa and hot tub decks that will soothe your aching muscles and your soul with design inspirations that are as beautiful as they are functional. 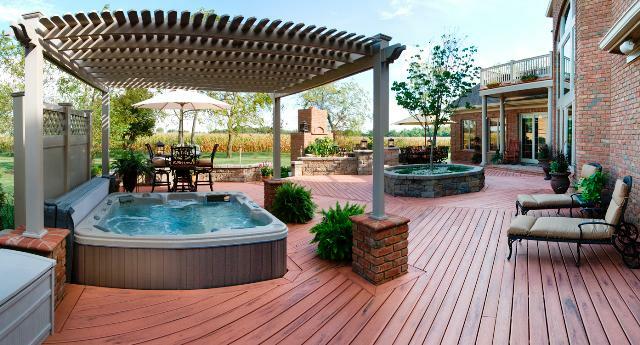 This spa deck in Columbus, OH by Archadeck of Columbus has everything a deck could possibly offer. More and more homeowners are choosing to invest in making their backyard into a place of refuge rather than splurging on exotic vacations and trips abroad in pursuit of the ultimate place to relax and rewind. Hot tubs and spas are a popular choice among homeowners seeking to create a tranquil setting to escape to while staying in the comfort of their own back yards. What could be more perfect on a brisk autumn evening than soaking in the hot tub with a glass of Merlot? The steam wafting in the cool air around you and the sounds of the season captured by the sound of crisp leaves blowing in the breeze. This scene is set and played out with your very own hot tub integrated as the focal point to your custom spa deck. With the dawn of the personal hot tub or spa comes the custom spa deck to compliment the structure and add valuable outdoor living space as well. A customized spa deck is perfect for entertaining, dining, grilling and cooking and any other activity you and your family enjoy doing outdoors. Keep in mind the need for easy accessibility from your home because you want to plan on using your spa during the fall and winter months for the utmost in warmth, ambiance and relaxation. Here is a stunning panorama of spa and hot tub decks that will give you some ideas and inspiration in your own backyard. This deck extension by Archadeck of Columbus even has a retractable awning for the ultimate in comfort. Here are some considerations when designing and building your spa or hot tube deck. A spa or hot tub deck is not just a deck with a hot tub placed in it or on it. There are certain areas within the structural criteria of a hot tub deck that must be met in order to accommodate the added weight for safety and to preserve the structural integrity of the deck as a whole. Many homeowners don’t take into consideration the full magnitude of the weight a hot tub or spa , once filled with water will add to the deck. This is why it is crucial to make sure your deck has the appropriate structural supports to accommodate the added weight of a hot tub or spa. When considering adding a hot tub or spa to your existing deck it is important to implement this support system as well. Utilizing the expertise and experience of a professional licensed deck builder to design and construct your deck is the best route to take when thinking of adding a hot tub or spa to the structure. In many cases a spa can add an additional weight of up to 2,000 pounds when filled with water and your deck will need to be sturdy enough to carry this weight without any stress. 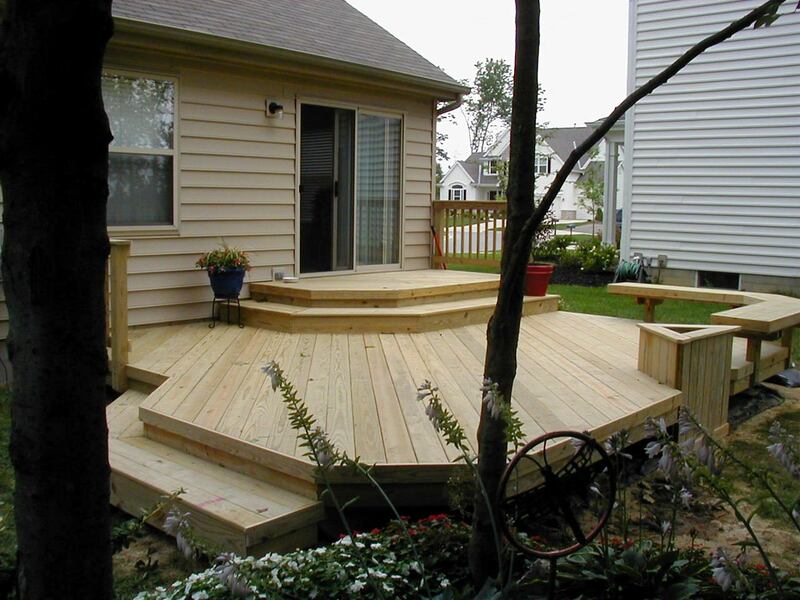 This sturdiness can be achieved by constructing a spa support deck, with either a concrete pad of wood platform. Another consideration is having accessibility to the mechanics of the hot tub or spa. If the hot tub is located on top of the deck, access is simple, but with a partially or fully recessed hot tub you may need a trap door or have an access area built around it on 3 sides so as to have access to the control panel. Trap doors such as these are quite easy and can be designed to be hidden from view. The curvilinear design of this hot tub deck wraps you in beauty and comfort. Aside from the structural diversity that is required when building your spa deck, there are many design options available when deciding how to finish out your spa deck. Above all, location of the hot tub itself is an important decision. Archadeck of Columbus likes to think outside the box in terms of locations for your spa or hot tub. Many times homeowners make the mistake of placing the hot tub in the center of the deck. This can be a major design flaw which will affect the flow and use of your deck. The first rule of thumb is to never place the hot tub in front of a window. This will become a regrettable decision because it will restrict your view and soon become an eyesore. From experience we have found that most popular with homeowners is partially recessing the hot tub within the deck. Hot tubs are most typically 3 feet high and many times homeowners decide to mount the hot tub flush with the deck so you actually “step into” the hot tub. We also see a great many top mountings as well. The only dangers we see if when the hot tub is partially recessed it can present a challenge when exiting and entering the hot tub, and a tripping hazard in some cases as well. For example, consider placing the hot tub within a curvilinear corner, or incorporate the spa to be surrounded by bench seating that will make the perfect place to sit down and take off your shoes to dip your fit in the warm bubbling water. If entering and exiting the hot tub seems as though it may present a problem, steps can easily be incorporated into the design to make gaining entry to the hot tub easy and safe. Keep space in mind as well when considering how your hot tub or spa will integrate into your decks design. If you choose a hot tub with a cover that has an arm, for instance, you will need ample space to back it up comfortably. When your hot tub is in use privacy as well as shading can be important. Many homeowners choose to build privacy walls adjacent to the hot tub, this offers shade from the sun and also keeps prying eyes away. 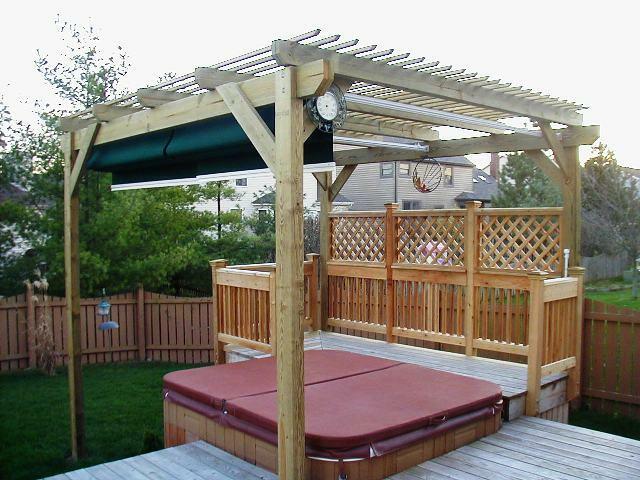 Pergolas look great when paired with hot tubs and spa features as well and can also provide ample shade and privacy. Selecting the right material for your hot tub or spa deck is also important, after all you don’t want to get splinters in those bare feet. There are many quality composite and PVC decking materials, as well as natural woods on the market that are designed specifically for areas around water. There are many brands that offer slip-resistance and that also keep heat build-up to a minimum so they are easy on your bare feet. TimberTech , AZEK and many others have lines specified for use on pool and spa decks, and some are even formulated for use on docks such as TimberTech’s Docksider decking. To experience more serene inspiration visit out pool and spa deck gallery located on our website. Author archadeckofcolumbusPosted on October 28, 2011 December 14, 2011 Categories Composite Deck Builders Columbus OH, Composite decks, Deck Builders Columbus Oh, Deck Builders Columbus Ohio, Deck Construction Columbus Oh, Deck Construction Columbus Ohio, Decks, Decks Columbus Oh, Decks Columbus Ohio, Low Maintenance, Outdoor Kitchens, PergolasTags Archadeck of Columbus, Azek Decking, Azek decks, Columbus decks, Columbus spa and hot tub decks, Columbus spa support decks, composite decking, Composite decks, Custom hot tub and spa decks Columbus OH, decks Columbus, Hot tub decks Columbus OH, outdoor living, Spa decks Columbus OH, TimberTech deck builder Columbus OH, TimberTech deck Columbus, timbertech decking, timbertech decks, TimberTech Docksider deckingLeave a comment on A custom hot tub or spa deck is a personal place of refuge and relaxation for many homeowners. Archadeck of Columbus is able to create three seperate outdoor structures that work as one. This double deck, patio and screen porch have the harmony and fluidity that many single structures lack, covering all the bases of style, design, quality workmanship and function with this winning triple-play. This large double-deck sits directly over the gorgeous screen porch and patio. It is not often that you have a combination of structures that work together effortlessly to create not just a grouping of spaces but an entire outdoor living area. These Columbus, OH homeowners definitely scored a triple play with this stunning second story double-deck, rustic screen porch and beautiful paver patio. Every inch of these structures are built with quality and style and they also create the feeling of one large, multi-functional outdoor structure despite the fact that they are actually three separate structures. These structures work together with harmony and fluidity as they flow effortlessly into one another, making it perfect for intimate get togethers and entertaining on a grand scale as well. Here is a video to experience to experience this entire outdoor living space. This photo shows how each of the structures by Archadeck of Columbus work together as one. 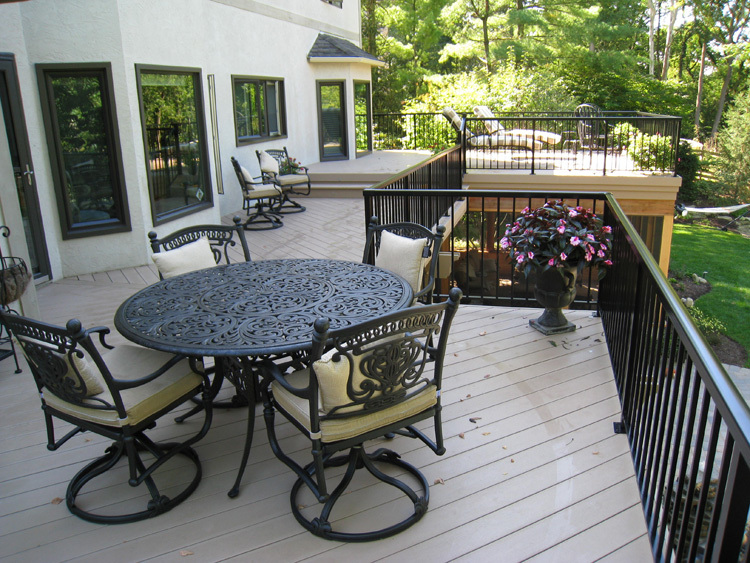 Archadeck of Columbus used composite, low-maintenance TimberTech XLM decking in Sandridge to cover the second story double-deck and accented it with black aluminum railings. On the lower level, a rustic screen porch welcomes you with its breathtaking and aromatic cedar walls and trim. The floor of the screen porch is finished with large concrete slab pavers that resemble tile to carry on the rustic theme, we also used Unilock pavers around the porch itself. The screen porch spills out onto a beautifully designed patio . As always, Archadeck of Columbus paid close attention to every important detail of this outdoor oasis by making sure the roof between the deck and screened porch below is a dry roof to keep out moisture that could cause damage to the structures. For the final touch we added small flush mounted low voltage lighting for safety and ambiance.